Telecommunications progressed from telegraph to telephone, from copper wires to fiber-optics, from analog to digital, from wireless to satellite. I believe the industry will change more in the next five to 10 years than it has in the last 50. The future will be faster, and people will be able to gather information from multiple sources rapidly. By 2025, it is predicted that 95% of children from eight years of age, and above, will have their own handheld telecommunications device. This will influence modes of communication and coaching strategies and change the very nature of social interaction. Leaders of the future will need to empower players to self-manage and become better equipped at facilitative capabilities. 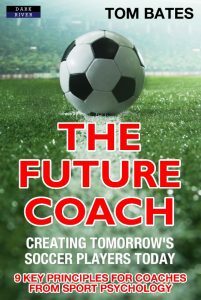 The new era of tomorrow’s coaching world will require coaches to foster and support creative independence. Independence of thought, decision making, and action. The new successful performance culture of the future will witness a power shift from coach-led player support, to player-led coach support. 1. Understand and integrate technology to engage, stimulate, and retain attention. 2. Create deep and meaningful relationships with players based on authentic trust. 3. Facilitate coaching practice by creating independent, co-created decision-making opportunities. The future coach must possess an ability to learn fast and apply knowledge from multiple sources. They must have a strong sense of leadership but retain an openness for new knowledge and be prepared at any moment to change in favour of an improved way of working. Above all else, they must be mindful of the multi-disciplinary nature of high performance and consider themselves both a master and a student in the same breath. Leadership and management are about knowing yourself inside out. Although times change, the principles of success don’t. Being unselfish, curious, hardworking and humble are admirable qualities that have caused me to engage with, and follow, the leaders who have guided my own career. As well as sticking to these principles, we must always question the norm to find new ways of doing things better. We must keep wanting to improve, all the time. 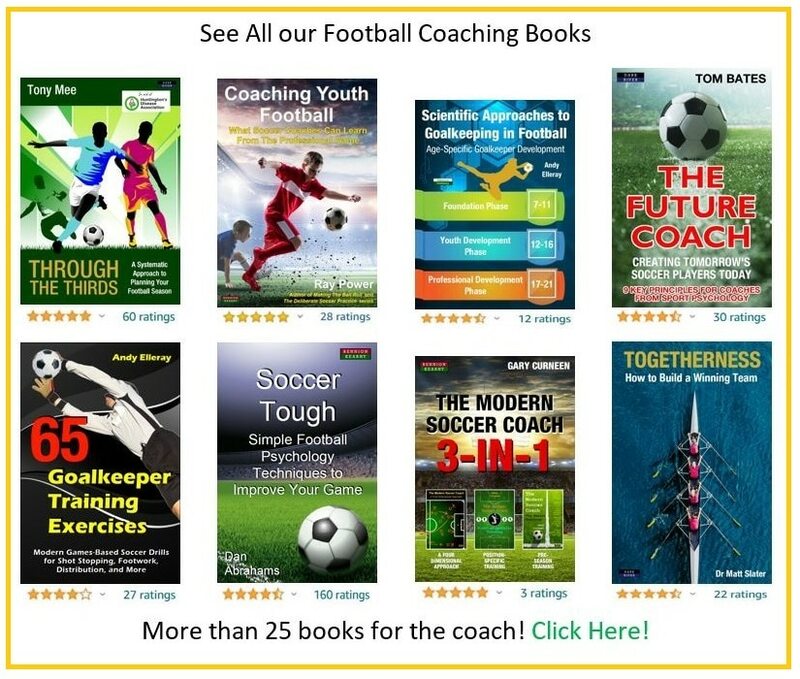 The future coach must be able to work across multiple disciplines, and become a reader and enthusiast for the expertise that enables learning, growth, and improvement. Technological advances will mean that the future high-performance environment will be data rich. Analysis of that data and intelligent selection will play a huge role in creating and sustaining a successful culture and environment. We already live in a world where we receive things instantaneously. The way we communicate via our handheld devices allows us to send and receive information straightaway. That changes the way people think, act and behave. The support resources surrounding the players now are on the verge of being overwhelming. We are in danger of being the most over-resourced yet under-resourceful generation. The leader of the future will need to be an outstanding curator of the many resources available to maximise potential, efficiency, and development – both at staff and player levels. We live in an age of instant gratification and that is only going to get faster. We must evolve with the modern modes of communication but retain the stoic moral values of our heritage and tradition. Effectively utilizing the abundance of resources at a technological, data, and staffing level requires a clear and prioritized understanding of your players’ immediate, short- and long-term needs. For instance, the endless match analysis data presented pre, during, and after a match can swamp any player. Knowing what you want to measure, when, and why, is as important as how much of it is delivered. Arsène Wenger, Manager of Arsenal FC, is well known for his beliefs about a coach’s ability to deliver concise information at the right times. For example, at half-time he will only focus on three points in possession and three points when out of possession so as to avoid information overload. He does this to appeal to the players’ needs in the context of the situation. Knowing his players, the emotions at that time, and the short window to communicate key messages, Wenger is able to adapt his management style to cater to his players’ needs. As a coach, he has selected key information presented by his analysts, digested it himself, and publically communicated the relevant messages to the team in a language and tone that fits the context and the culture. Whilst a coach communicates with his team publically, they are also aware that connecting with individuals before and afterwards can be as valuable as the group message. Some players need a quiet one-to-one to clarify information and boost confidence, others need to be left alone to self-manage. Some need a kick up the backside, and others require a pat on the back. What’s most important here is that, as the coach, you have a very good understanding about what works for each of them. This understanding is only gained through time, patience, and the creation of opportunities for constant communication. A central theme running through this book is empathy and understanding. As a coach, see the world through the eyes of your players. Understand the challenges each player is facing. We will re-visit a multitude of exercises, similar in nature, to emphasise and reinforce alternative methods of achieving particular traits and underlining their importance for coaches as a cornerstone in their players’ development. Every player needs to know that there is always an opportunity (should they need it) to come and speak with their coach. When players are young, this also goes for parents. Reassurance is like medicine and sometimes just knowing the door is open provides a sense of security and connection. Create an opportunity to invite a player to meet with you privately. Take the time to get to know something about them that you didn’t know before. This could be where they live or where they were born, which team they support, or their favourite player in the world. The simpler the better. Effective relationships are built on trust. Make sure the player leaves you having learned something about you too. This will ensure that they feel they know you a little better. This could be a favourite musician, food, or family fact. Know your players’ ambitions and motivations to achieve their goals. This is the essence of seeing the world through their eyes. Create development goals together rather than imposing them. Take the time to build a performance profile in which the technical, tactical, physical, and mental traits required to succeed are logged. These traits should be the ones the player (and you as coach) believe are needed to be the very best in their position. This will help you build the player’s job description and offer a vital tool for measurement and accountability. Ensure that the player takes ownership (under your guidance) to list their traits and set their goals. – Physical: Strength to hold defenders off, Acceleration to break away from defenders. – Technical: Close range finishing one-on-one. – Tactical: How to play as a ‘false 9’ in a 4-3-3. – Mental: Staying confident after missing key opportunities. – Emotional: Staying calm and composed in 1 v1 situations. – Social: Speak at the team meeting and offer opinions. – Personal: Create time for my family, call mum and dad once a week! – Lifestyle: Ensure I’m in bed before 11 pm each night. Replace nutritional plan every week. 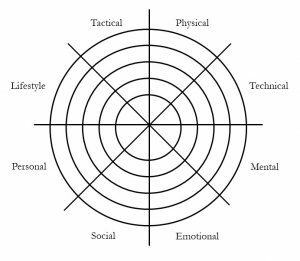 The player performance profile is a tool to measure, manage, and monitor specific traits required to succeed in each position. It is a collaborative method for facilitating performance development and improvement. The profile can be used to both write and record performance goals in each category, and track progress over time. There is an sample blank profile, below. – The ability to stay composed under pressure. – Energy to motivate himself/herself. – Remaining calm in conflict. 3. Both parties examine the differences between scores/viewpoints. 4. Both parties try to work out why there are differences in perceptions. 5. The coach and player then calculate a score, and work out what can be done to improve the score, for this player, in this situation. The current score – between 0 and 10 – is then marked on the profile wheel (0 = low grade, 10 = high grade; 10 is the outermost ring). When you understand the things that can get in the way of a player achieving their goals, you can effectively help to remove them. For example, travel to training in the evening may be a problem due to lack of transport options. Providing transport removes the anxiety associated with the problem and creates more time to focus on the goal of constant improvement. During a de-brief, make a short list of the player’s strengths and areas for improvement. If you have access to the stats on their performances, or video clips, they are excellent tools. Sandwich the feedback, presenting a key strength, then an area for improvement, followed by another strength. This structure reassures the player that there were good things in the performance and that there are also areas to improve on. Crucially, end any interaction on a positive note! What worked yesterday won’t work today and what works today won’t work tomorrow. The future coach will continue to innovate, recognising and adapting to the constant developments in technology and society which are changing the way we live and engage with the world around us. The way information is shared and taught in educational institutions will rapidly be aided by an emerging trend of virtual online advancements. Despite the rise and benefit of information technology, and the need to incorporate teaching methods accordingly, the future coach must appeal to the connection and relationship with the human being. Inevitably, relationships will be defined in an age of independence by a coach’s capacity to see the world through the eyes of their players, placing players’ needs above their own. The future coach must work toward sustaining high-performance environments that allow for co-created independent thinking, both on the pitch and off it. Modern-day winning cultures will evolve to allow constant interchange between player-led coach-supported, and coach-led player-supported, working dynamics. 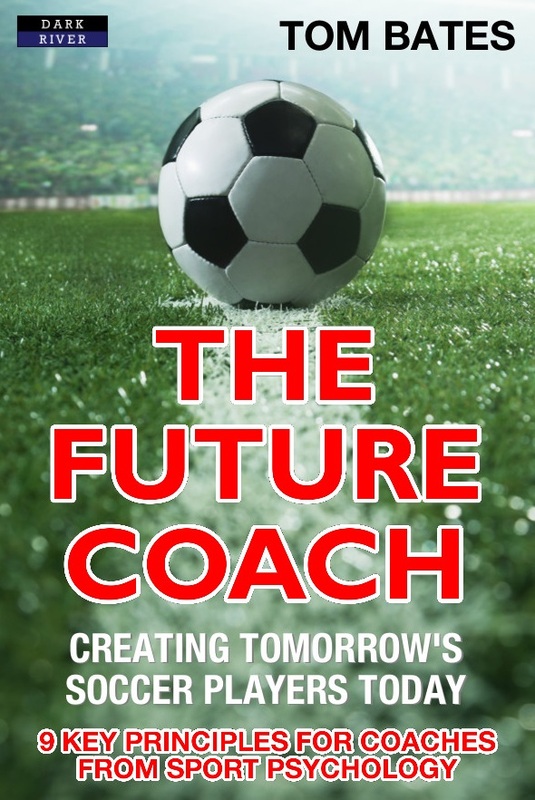 The future coach will need to be an architect of affectionate authority riding the crest of innovation whilst remaining grounded in the foundation of their core values. In an age when dictatorships will continue to fall, collaboration will be crowned the new king, and the future coach will rise.